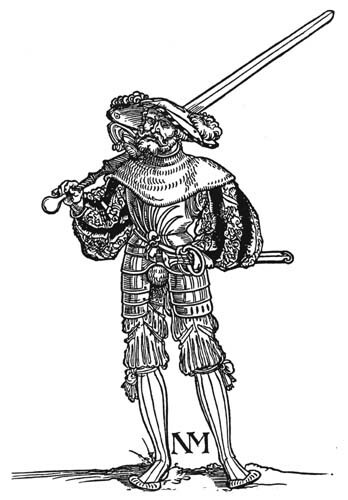 2-handed swords were specialized infantry weapons, used commonly in the 15th and 16th century, especially by German and Swiss armies. Considering the amount of specialized training required, extra-pay was often given to 2-handed sword wielders. • Expanded cruciform hilts (15th century – continued usage in the 16th century in Italy), with side rings on the quillon blocks. • In Germany, 2-handed swords were given ricassos to allow for safe wielding below the quillon, while also adding triangular projections at the ricasso’s base. The purpose of this is to help with close combat. • Ricassos were also equipped with parrying hooks to help with the low speed of using such a heavy weapon when being in a defensive stance. • Many of these arms were given compound hilts and cross-guards of up to 30 centimeters. • Most 2-handed swords weighed 2.2-3.2 kg (they are not as heavy as they look). • Swiss/German Dopplehander and Bidenhander for 2-handed swords. • English Slaughter-Swords, named after the German Schlachterschwerter. • A variant of the weapons known in German as Flammenschwert or in English knows as flambards or flamberges, which has a visually beautiful blade, but is not more effective than regular looking straight blades. • German Paratschwert or in English parade-swords that weigh up to 7kg (very heavy for a two-handed sword), and were used only for parades and ceremonies. 2-handed swords also differ from regular in their competitive use. There are no records of those weapons being used in duels or fencing. These arms were used primarily for fighting among pike-squares, using slashing and stabbing tactics, as described by Paulus Jovius during the early 1500s, when the Swiss used them in the battle of Fornovo, 1495. 2-handed swords were also used as honor weapons by highly paid people, specifically for the protection of royal property such as banners and castle walls. 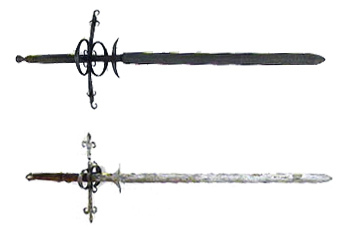 According to Dr. Hans-Peter Hils in his dissertation of the 14th century Master Johannes Liechtenauer, he noted that many museum collections feature 2-Handed Swords as if they were combat weapons, while completely ignoring the quality of these arms, and how most of the displayed weapons are inefficient for battle. Most of those weapons in museums were ceremonial weapons and were not used in fighting. In Switzerland and Germany, where mercenary bands were commonly hired, 2-handed swords and halberds were used as trademark weapons. As such, during the 14th century, there was widespread production and exports of those weapons throughout Europe. Major producers would be the Swiss, Germans, and Italians. This would change, as 2-handed swords would be limited by law by the time of the 15th century, specifically after Swiss and German armies adopted pikes for weapons as more practical tools. There is a source that shows that within the 16th century, two-handed swords were limited to function as a way of breaking enemy pikes in wars. As such, those who were given double pay to wield those weapons were placed in the front ranks of armies for this job. The enormous momentum in addition to the size of the weapon and the long reach, made it very tough to block, allowing the wielder to crush rapiers and pikes with ease in combat. Eventually, their use would be limited when the war would become short-distance combat focused, due to the weapon’s slow speed, and as such it disappeared as a war weapon. How did fighters carry two-handed swords? Most two-handed swords and longswords can be worn on the hip without much hassle. It just depends on proper attachment and the right angle. They weren’t that much bigger than one-handed swords. Sometimes, wearing them on the hip, was a little bit uncomfortable, but carrying a sword is not really about comfort. It’s about defending yourself. The other way to carry the two-handed sword was just to hold the weapon in hand, and the blade would rest on the shoulder like you see in the picture. This way, it was easy to carry the sword as all you needed to do is balance the sword on your shoulder. This great video below explains how two-handed swords were carried in Renaissance and Medieval Ages. There is a misconception that two-handed and longswords were much bigger and heavier than single handed swords. Actually, two-handed swords and one-handed swords were pretty close in weight. A second misconception regarding the weapon is how it is used in combat. 2-handed swords are mainly used as chopping, hacking, and cutting weapons. They require the use of brute force and a strong arm, and not on agility. The sense of agility and nimbleness seen with smaller swords is found due to the fact that smaller swords focus on cutting, not chopping. A third misconception is, one-handed swords are thought of as superior due to their speed and mobility in movement. This is found to be false when the specs of each weapon are compared. A fourth misconception is related to weapon technologies at the time of the 2-handed swords. Many would assume that a 2-handed sword would not have been made lighter due to primitive methods of welding arms, but this is not the case. • Two-handed swords may actually be faster than one-handed variants. The reason for this is two-handed swords are powered by two hands while weighing nowhere as close as twice the weight of a one-handed sword. Many usually weigh between 1.1-1.8 kilograms, and at most are 2.5-4 kilograms for the enormous variants. • The reach of the two-handed sword may be comparable to the one-handed, due to the one-handed wielder’s ability to move their body, and increase their reach through side-moves. • Regardless, the momentum of the two-handed sword is larger, therefore allowing the weapon to overpower the one-handed sword in leverage, especially when both weapons cross. This also makes the weapon impossible to parry, without risking being smashed through. • In battle, the two-handed wielder has an advantage over the one-handed wielder. To equalize the strength, the one-handed wielder would need an additional one-handed weapon, therefore forcing the two-handed wielder to worry about dealing with two weapons. Even though the weapons usage did not last for more than two centuries, it was still used nevertheless and plentifully. 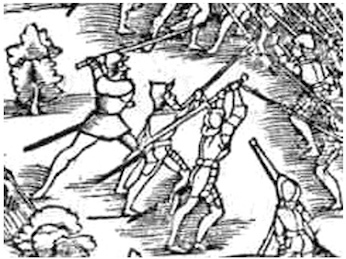 This shows that there were technologies available in the past that allowed those weapons to be lighter than they actually look, making them usable.Two-handed swords were strong enough to break enemy armor, but light enough to be used effectively. That is why Medieval and Renaissance knights loved them. Two-handed swords were strong enough to break enemy armor but light enough to be used effectively. That is why Medieval and Renaissance knights loved them. Previous Previous post: How much did a medieval mace weigh? Next Next post: How to be a knight in the Middle Ages?